I come from a long line of strong women on my maternal side – women who have also been touched by dementia. Both my great-grandmother and grandmother ultimately passed away from Alzheimer’s-related complications. My mother, Shawn, was the mother that all my friends wanted to have, the one you could talk to about anything. She was my confidante and my support system, raising me and my brother as a single mother from the time I was twelve. She was such a kind, affectionate, bubbly, funny person. She liked to do good deeds for others and was incredibly good-hearted and thoughtful. I called her “mama bear” because she would do anything for her cubs. In the summer of 2015, at 55 years old, my mom started showing signs of memory loss. With our family history of dementia, I definitely recognized that some of her symptoms weren’t “normal aging”. The real turning point was when she got lost driving to our family doctor’s office, in a community that we’d regularly visited since I was little. Still, mom insisted that nothing was wrong with her. I was the one who ultimately made the appointment to get her a mini mental test. The results showed that something was wrong, as I’d suspected. In January 2016, she was referred to a cognitive clinic. After some testing, on April 1st, 2016 she was officially diagnosed with Alzheimer’s. My mom was just 56 years old, while I was only 26. My aunt and brother were in the room with us when we got the diagnosis. All three of them cried, but not me. I felt numb. In a way, I think I’d already accepted that she was ill, but now it had become ‘real’. I knew then that our lives would never be the same. There was never a full discussion about it, but I became mom’s primary caregiver by living with her while going back to school online. Some people tell me they think it’s ‘brave’ to have stepped up as her primary caregiver. Sure, I don’t want to put my life on ‘pause’, but taking care of her was something I really felt I had to do. It’s my way of thanking her for being such a wonderful caregiver and mother to me. At 28 years old, most people are starting their own lives and families, but I’m trying to take care of a parent while still trying to finish school, find a new career and date. Dating is probably something that most caregivers of people with Alzheimer’s don’t have to worry about. I don’t want to put my own life on hold and still want to experience what I can. But sharing my experience with others is extremely difficult – not because I don’t want to let them in, but because Alzheimer’s disease is scary to so many people. I often get asked whether or not I’ll get the same disease as my mother, or if I feel “cursed” because of my family history. I don’t think I would be asked those kinds of questions if I was caring for a parent with another disease. I still have my mom physically, but I’m losing more and more of her. My mom has accepted having dementia and knows that something is wrong, that her brain isn’t working “right”, but she doesn’t like to use the word “Alzheimer’s”. She’s depressed and cries a lot, saying she hates this disease and that she wishes it never happened to her. On the worst days it’s only our toy poodle, Lucy, who can bring a smile to her face. One of the hardest things beyond the day to day is that when I think of our future, I can’t help but feel a sense of grief and loss. My mom would have made the best grandmother and always talked about wanting grandchildren. Now, if I do end up having a family of my own, they won’t be able to fully know her. 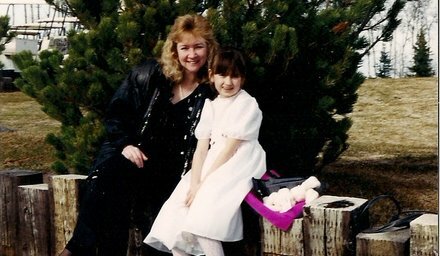 My mom won’t be there to pick out my wedding dress, or likely even be at my wedding. There is no cure for this disease, so it’s easy feel hopeless and helpless. I’m scared to see her lose her physical capabilities. My greatest fear is for her not to recognize me and not know that I’m her daughter. It’s a pain hard to explain, one I can only express by saying I feel a great amount of loss, sadness and even some jealousy that others have what I don’t. It can also be hard to explain to others what exactly Alzheimer’s disease is and all it entails, especially trying to explain what daily life is like and the emotional struggles I go through. Caregiving can be a major strain on my own mental health and well-being. Even a little bit of "alone time" is now a luxury I can’t take for granted. Sometimes I feel like damaged goods or a ticking time bomb because of the response I get from others when discussing the possibility of me getting Alzheimer’s. I don’t know what the future exactly holds. I haven’t taken proactive steps for my brain health, but I’ve gained a new attitude. I’ve learned that I’m stronger and more capable than I ever thought I was before. I am determined and I have persisted. I will fight for the ones I love and do anything I can to help them. I want people to understand what Alzheimer’s really is and all that it contains. Alzheimer’s is not just about memory problems. It is so much more complicated and has more symptoms. I would like to see more awareness about the other symptoms of Alzheimer’s and how family members who become caregivers are affected. Alzheimer’s changes a person and the lives of everyone around them. Along with my changed attitude, I now try to enjoy life more and not take the ‘little things’ for granted, because I know how quickly things can change. Just like my mom, my brain health and who I am could possibly be taken away from me. You cannot put off anything you really want and say you will do it later, because you might never get the chance to have those experiences you’ve put off. Treasure the ones you love and spend as much time as possible with them. I hope people who hear my story decide to never take their good health or families for granted.